Snakes and Dragons. What an interesting title for a set of decals - two sets, as a matter of fact. The "snakes" portion of the title refers to the VFA-86 Sidewinders, MCAS Beaufort, NC, as of January, 2011. The "dragons" segment refers to the VFA-192 Golden Dragons, NAS Atsugi, Japan in October, 2009. The decals come packaged in a zip-lock bag along with a full-color instruction sheet. On the front side of the sheet the two Air Group Commander's (CAG) aircraft are depicted in profile. This shows the decal placement on the sides of the aircraft. There are also several detail photographs of the actual airplanes, which come in handy when placing some of the decals. On the backside of the sheet are the top and bottom views of the aircraft showing decal placement in these areas. There is also a color guide for painting the aircraft. Paints listed are FS numbers, Model Master, Humbrol, Gunze Sangyo and Xtracrylics. 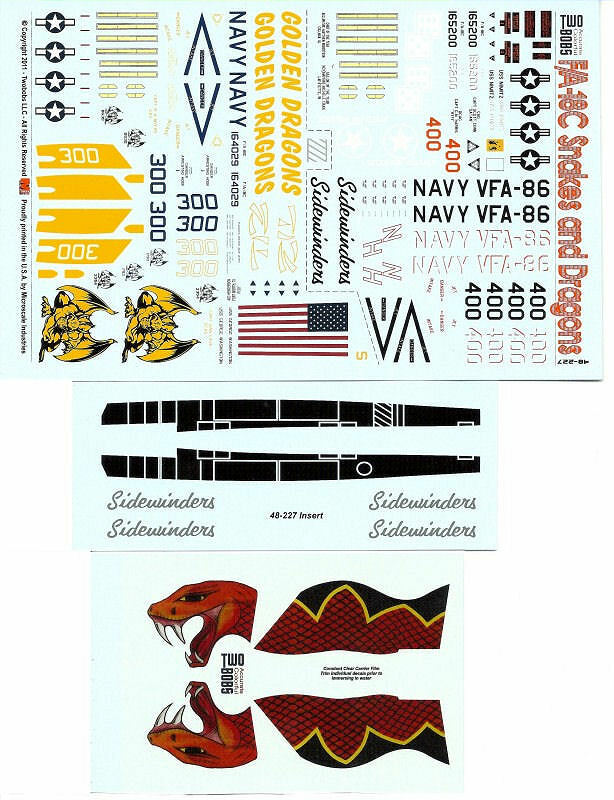 The instructions state the decals will fit the Hasegawa, Monogram, and HobbyBoss models. It is apparent that a lot of research has gone into making these aircraft decals as accurate as possible. This set of decals comes on three sheets. They include everything you will need - national insignias, unit designations, airframe stencil data, and the artwork that makes these two aircraft so distinctive. These decals are top quality. They are very thin, with minimum carrier film around the edges of each item. These two qualities should allow the decals to settle down nicely on the model's surface using very little setting solution, if any. The colors are bright and the artwork is sharp and crisp. The registry is perfect. The national insignias for the Golden Dragon aircraft come in two parts. The red bars must be placed after the white star on the blue background is placed. Such an arrangement may cause some aggravation, but it should be minor. The national insignias on the Sidewinder aircraft are one-piece black-and-clear decals. These decals are top-notch quality and are a good value at the price. 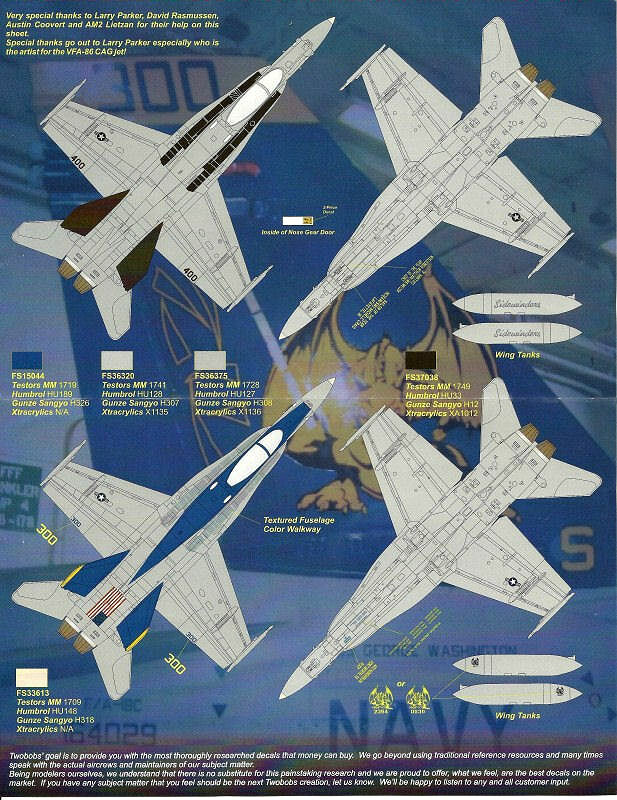 I can easily recommend this beautiful set of decals for your next F/A-18C model. Thank you to Twobobs for the review item and thank you IPMS/USA for allowing me to do the review.